Push-Back Rack is a means of high density storage with good selectivity. 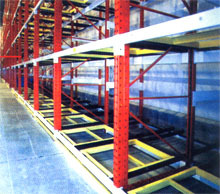 Multiple Pallets are stored on a gravity-fed cart system, allowing retrieval of the pallets from the face of the rack. The carts support the pallets allowing for some variation in pallet sizes. Systems are custom designed as 2,3,4 or 5 pallets deep and are normally used against a wall or in back – to – back rows.